Several years ago my sister and her family started the tradition of making and decorating gingerbread houses on Thanksgiving weekend. My husband and I have joined in for the last few years and now that we have a little family of our own, we definitely want this to become one of our family traditions. We weren't sure our little 1 year old would have much interest this year, but we were soooo wrong. Little "R" had the time of her life. She thought she was such a "big" girl helping to decorate, and then of course there was the candy...so much candy. What little munchkin wouldn't be in heaven? We of course won't be eating this creation. The gingerbread recipe I use for the house's cooks up as hard as a rock and after a few weeks the candy would chip a tooth. But it's sure fun to look at through the holidays. 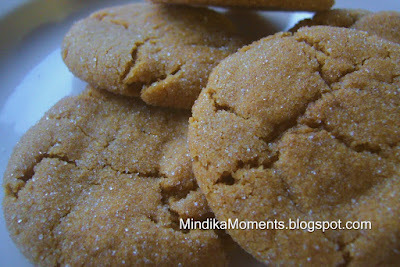 For our gingerbread taste craving, I prefer these delicious "soft" gingerbread cookies. Most everyone I know already has this recipe, so sorry it's not that original. But just in case you don't have it, I had to post it. These are the yummiest cookies ever. I have to admit, I sometimes make these even when it's not the holidays. 1. Combine the flour, ginger, baking soda, cinnamon, and cloves in a small mixing bowl. 2. In a mixing bowl cream the butter sugar and egg. Add the molasses beat well. 3. Stir the flour mixture into egg mixture. 4. Shape dough into 1 inch balls. Roll in sugar to coat. 5. Bake at 350 degrees for 10 minutes. 6. Makes 2-3 dozen cookies. Brooke, I would be happy to post the gingerbread recipe I use for the houses. I'm headed out of town tomorrow afternoon though and don't have time to type it up etc... Will next Monday be ok? That would be great! Thanks, again! Have a good weekend! Can't wait to see your Studio 5 appearance.